WalletHub conducted an in-depth analysis of 2015’s States with the Best & Worst School Systems. 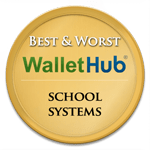 To find the best school systems, WalletHub compared the quality of education in the 50 U.S. states and the District of Columbia by analyzing 13 key metrics. Our data set includes such metrics as the pupil-teacher ratio, dropout rates, standardized-test scores and bullying incidents rates.